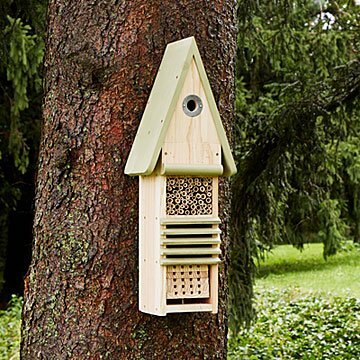 Give birds and beneficial insects, like bees, a safe place to winter with this four-level "hotel." There's nothing quite like the warm, cozy feeling of staying in on a chilly day. But humans aren't the only ones who like to cuddle up when it's cold out. Birds and bugs need protection from the elements, too. Give them a comfy place to wait out winter in style with this four-story hotel, crafted from FSC-certified timber. Each "floor" is specially designed to accommodate tiny guests.The top chamber offers roosting birds warmth and shelter from predators, while third floor "amenities" include bamboo tubes for wintering insects (like ladybugs and lacewings) and nesting space for solitary bees. The second level can be filled with bark, straw, and leaves for the animals to use as they furnish their new rooms. Leafcutter and mason bees can check in on the first floor, where trays provide a safe place for them to lay eggs. When spring arrives, your little visitors will pay you back by sticking around to pollinate plants, eat pests like aphids, and add to the natural beauty of your outdoor space. Made in China. The trays can be released for inspection/cleaning by unscrewing the bolt in the base. Site the box from 3'3" to 8'2" high, ideally facing south east, out of prevailing winds but to catch some early sun for solitary bees. Other siting is possible (sun/shade/high/low) and this will attract different insect occupants.